Last year around this time we looked at elastic ankle pants. Little did we know this trend would not only continue this year, it would explode into a trend of it's own: joggers. I love the comfort this piece provides but I fear the pajama look they mimic. So I tend to look for a print that is daytime appropriate and fits well. Let me show you what I mean. See what I mean? Adding a great heel to these pants makes them work appropriate or date night ready. A bright white pant is perfect for a summer night. 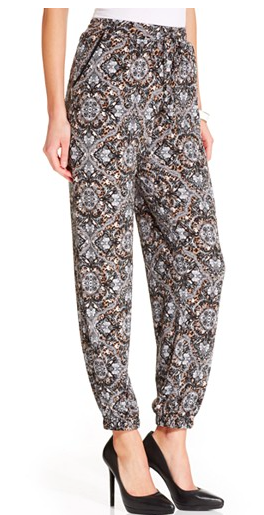 These pants are also available in petite! Who doesn't love an allover ikat print? Right. And pockets. You won't find me in this crop top anytime soon but these pants? I love these pants. The jogger trend is pretty great for ladies who love comfort, oh wait, that's all of us. All of the options above are machine washable and $50 or under.